Hey there! Body Shift project coordinator, Olivia O’Hare here to share what’s to come in 2018. After a heavy emphasis on performance and advancing the skills of long term participants in 2017, the Body Shift team has agreed that it is time to focus inward in the new year. 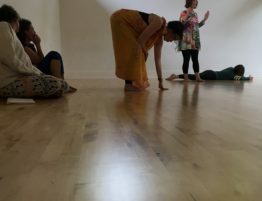 We plan to cultivate space for folks who are new to dance as well as dancers/teachers who hope to learn how to make their own classes more inclusive. Have you ever been curious about dance but thought to yourself, “I have too many limitations to dance,” or “I’m too shy/awkward/uncoordinated to dance”? Have you been thinking that you want to get moving and find a fun way to exercise but don’t feel comfortable in traditional exercise classes? 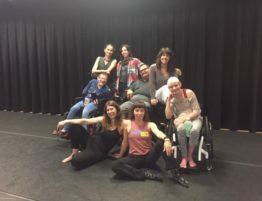 Or – Are you a dance/movement teacher or choreographer interested in making your work more inclusive of people of all abilities? Are you curious about the current redefinition of dance and the potential diversity of the dancing body? With this in mind the January Elements classes will be geared towards welcoming true beginners and offering exercises that could be added to any teachers toolbox to make dance accessible to all people. 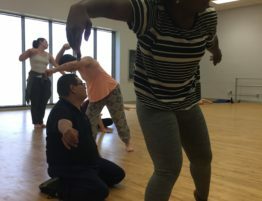 We have an awesome mixed-ability teaching team on the roster – Veronica DeWitt and Juan Munoz – who have been cooking up some lesson plans that explore the fundamentals of the DanceAbility method. 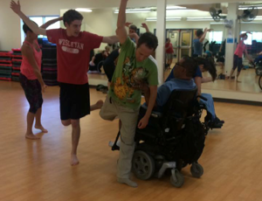 DanceAbility is based in improvisation and meant to be practiced by people of multiple abilities and skill levels dancing together. Rather than imitating prescribed moves, you can be a beginner and learn tools to create your own dance and move in ways that feel good to your body. You can be a professional dancer and be challenged to move in new and unique ways outside of your habitual patterns. 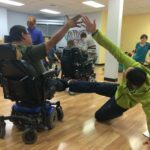 Practicing the DanceAbility method provides an outlet for creative expression through movement, develops body awareness, and explores non-verbal communication. It also gets you bending and stretching and sweating – basically, it tricks you into exercising with tasks that allow you to move at your own pace and have fun! 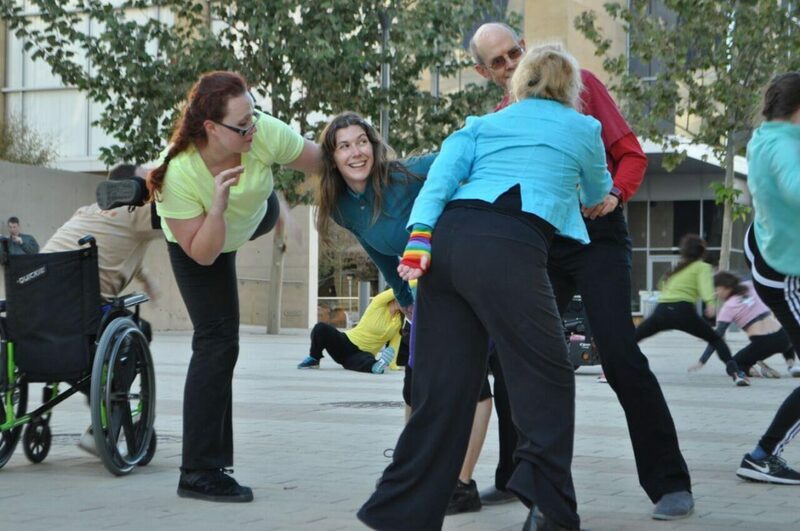 Besides continuing to practice DanceAbility, we will also have guest artists teaching other forms of movement improvisation in the Elements class. In 2017, Lauren Tietz offered a series of classes in Lisa Nelson’s Tuning Scores. We hope to have her back later this year for more Tuning Scores and you can look forward to learning some new skills from our February guest artist, Brandon Gonzales. 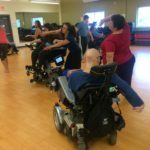 All the guests we invite to teach the Elements class have experience teaching in a mixed-ability setting and/or have spent time prepping with one of our lead instructors to ensure that we do our best to offer an environment in which no one feels isolated. Last year, in addition to our twice monthly Elements class, we began holding dance jams every season. This gave our long time participants as well as more experienced movers from the theatre and dance community a space to practice there skills. The jams were so well attended that we will continue to have seasonal jams this year. Also, we are excited to announce that we will be looking for a venue to have an accessible dance party with plenty of space to roll, stroll, and boogie without restriction to fun music! Let us know if you have suggestions for a cool club, hall, or studio that is fully accessible and centrally located. 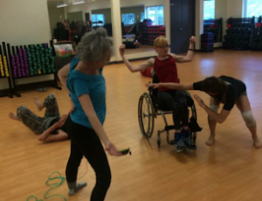 Body Shift dancers, some in wheelchairs and others standing, move about a spacious room in Elements. Come shift your perspective with us this year! If you are intimidated or unsure what to expect from taking class I encourage you to come observe. If two hours seems like too long for your stamina level, join us for the first half of class. 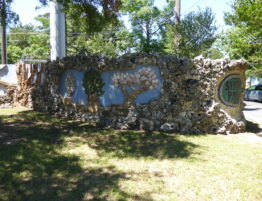 We are happy to make accommodations in order to make class friendly to a diverse range of needs. The Elements class takes place 2:30-4:30pm every 2nd and 4th Saturday of the month at the Townlake YMCA in the first floor group exercise studio (1100West Cesar Chavez St). No gym membership is required to attend. Open to adults age 16 and up; all ability and experience levels. No registration necessary and fee for class is on a sliding scale from $5-$20, cash or check accepted.